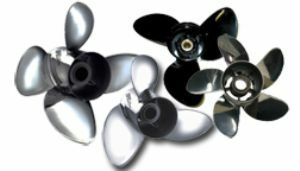 Michigan Wheel's OEM replacement aluminum boat propellers feature a high gloss black powder coat finish which minimizes drag and protects the aluminum. The cushioned rubber hub absorbs impact, reducing the potential for lower unit damage. These aluminum propellers are backed by Michigan Wheel's limited lifetime warranty. The Michigan Wheel Apollo is a highly polished, ultimate performance stainless steel propeller. The Apollo propeller is designed to use Michigan Wheel's XHS exchangeable hub system. The Michigan Wheel Apollo is highly polished ultimate performance stainless steel propeller. The Apollo 4-Blade propeller improves hole shot on heavier loads and is a great propeller for pulling and towing in watersports. The Apollo propeller utilizes Michigan Wheels XHS exchangeable hub system. The Michigan Wheel Ballistic is a high performance stainless steel propeller with proven power tip for peak efficiency. Blade tip and cup combine to improve bite and reduce power loss. Highly cambered propeller blade sections provide for higher speed and better bow lift. Whether you’re pulling skiers or hauling to your favorite fishing hole, Mercury’s groundbreaking High Five propeller offers class-leading acceleration. Its five-blade design pulls strong and smooth, even in rough water. The High Five is an excellent fit on V6-powered stern drive runabouts where tow sports are a priority. Among freshwater fishermen who fish in rough water, the High Five has a very loyal following due to the excellent holding of the five-blade design – a propeller that will stay hooked up even when the going gets rough. 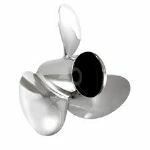 Powertech-ELE3, 3 blade stainless steel propeller, Xtreme-Value series, high polished, diameter varies with pitch, pitch range: 15 thru 21, easy to turn, good overall performance. Powertech-ELE4, 4 blade highly polished stainless steel propeller, Xtreme-Value series, diameter changes with pitch, available pitch range: 15 thru 21, improves hole shot, handling, mid range, cornering, good all around 4 blade stainless propeller.